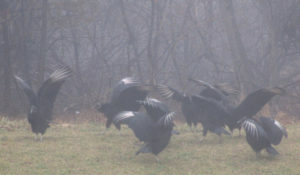 The dance of the black vultures, “Coragyps atratus,” in a professional park in Plainsboro, Middlesex County. These vultures were near a deer carcass, so they could have been spreading their wings to rid them of any bacteria picked up while feeding on the dead body. Or it could be a simple drying of the wings, although the day was foggy. 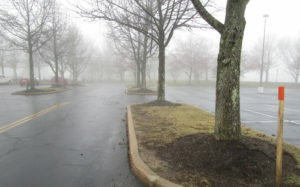 Black vultures on a foggy day in a professional park in Plainsboro, Middlesex County. BLACK VULTURES ON A CARCASS: In a professional park in Plainsboro, Middlesex County, lie a well-picked-over carcass of a deer, “Odocoileus virginianus,” presumably the victim of motor vehicle accident. It was not picked-over enough for black vultures, “Coragyps atratus,” to be uninterested. There were about 10 on or near the carcass. Black vultures feed on “mostly carrion,” according to the National Audubon Society website. The species “feeds on carcasses of dead animals of all sizes.” And from Cornell University’s All About Birds website, “Turkey vultures (“Cathartes aura”) have an excellent sense of smell, but black vultures aren’t nearly as accomplished sniffers. To find food they soar high in the sky and keep an eye on the lower-soaring turkey vultures. When a turkey vulture’s nose detects the delicious aroma of decaying flesh and descends on a carcass, the black vulture follows close behind. One on one at a carcass, black vultures lose out to the slightly larger turkey vulture. But flocks of black vultures can quickly take over a carcass and drive the more solitary turkey vultures away.” I saw no turkey vultures at the carcass. 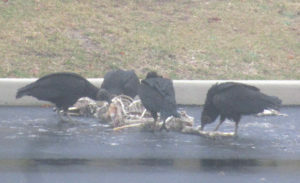 Black vultures on a deer carcass in a professional park in Plainsboro, Middlesex County. DEER DAMAGE: Damage from browsing deer, “”Odocoileus virginianus,” is quite apparent, if you know what to look for. Look where ornamentals are planted. If you see arbor vitae with a thin bottom and a tipped top, kind of like an arrow pointed upward, you are probably looking at deer damage — the bottom being what is easily reachable to the deer, the top being harder to reach or out of reach. 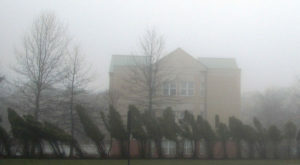 Deer damage on these evergreen ornamental trees on a foggy day in a professional park in Plainsboro, Middlesex County. MULCHING TREES: The concept of mulching a tree is to retain water to the root area while the tree is getting established. Well, if you are going to mulch, please do it correctly. That is, think “doughnut,” not “volcano.” Regarding the proper way, build a “doughnut” outside of the trunk — the hole around the trunk, the ring not touching any trunk or roots. Run the rim out to the end of the root ball or to the end of the tree canopy. The mulch should be only 2- to 3-inches deep. (Regarding a volcano, its massive depth could introduce and hold contaminants, while its touching the tree could introduce contaminants to the tree itself. Also, why mulch an established tree? Aesthetics — and property owners love aesthetics. Sorry, but I view that as image over substance. Volcanoes, the wrong way to mulch a tree. Here in a professional park in Plainsboro, Middlesex County. THE DRIVE-BY NATURALIST: A doctor’s appointment in this Plainsboro, Middlesex County, professional park got me a lot of material for this writing. So, as I keep reminding, be prepared. There is a lot of nature around us. As much as I preach about keeping an eye out for things happening in the natural world, I missed a rare photograph — a flying adult bald eagle, “Haliaeetus leucocephalus,” and an Air Force jet circling Joint Base McGuire-Dix-Lakehurst. Per my duties as a state Division of Fish and Wildlife volunteer, I was observing the Upper Millstone River eagle nest on the boundary of Mercer and Middlesex counties, including shooting photographs. An adult eagle left the nest and was circling the area, flying farther and farther south from the nest — in the direction of the military base. At the same time, the Air Force cargo plane was circling the base. There they were, two flying symbols of American freedom in one frame. Well, nowadays, I have only a point-and-shoot camera. 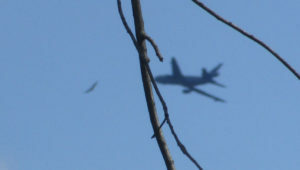 Instead of focusing on the eagle and plane in the background, the camera focused on the tree branches in the foreground. So, the eagle and plane are a blur. My fault. Despite the capture-the-moment shot, I should have made sure the camera was properly focused. A missed photograph opportunity of two flying symbols of American freedom — a bald eagle circling in front of the Upper Millstone River nest and a plane circling Joint Base McGuire-Dix-Lakehurst. 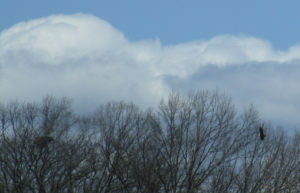 An adult bald eagle flies into the Upper Millstone River nest, left, on the boundary of Mercer and Middlesex counties. SNOWFALL THIS WEEK: This week at my house in Monroe, Middlesex County, snow fell Monday, April 2 — and estimated 2 inches. Also on April 2, I noticed the first forsythia blooming this season in Mercer County (Hightstown and East Windsor) and Middlesex County (Cranbury and South Brunswick). 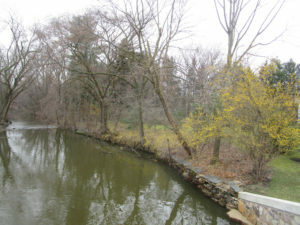 Forsythia blooming along Cranbury Brook in Cranbury, Middlesex County. A tranquil Brainerd Lake (informally “Cranbury Lake”) in Cranbury, Middlesex County, on the day it last snowed, Monday, April 2. It was a wet snow of about 2 inches and melted very quickly — before this photograph was taken in the afternoon. SNOWFALL, I TOLD YOU SO: I keep noting we can get snowfall until about April 15. This year, it is proving true. Based on my record-keeping, since the winter of 1995-1995, the latest snowfall accumulation in Monroe, Middlesex County, was 3.5 inches in 1996, April 9-10, and the latest snowfall without accumulation was in 2007, April 16. 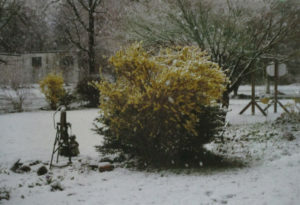 From the Joey Archives: 1996, April 9, Tuesday — Snow on blooming forsythia in Hamilton Square, Mercer County. SUNRISE AND SUNSET: For the week of Sunday, April 8, Sunday, to Saturday, April 14, the sun will rise from about 6:30 to 6:20 a.m. and set about 7:30 to 7:35 p.m. For the week of Sunday, April 15, to Saturday, April 21, the sun will rise about 6:20 to 6:10 a.m. and set about 7:35 to 7:45 p.m.
Sky photo, No. 1: My backyard in Monroe, Middlesex County. ATLANTIC OCEAN TEMPERATURE: The Atlantic Ocean temperature off New Jersey was about 45 degrees. Sky photo, No. 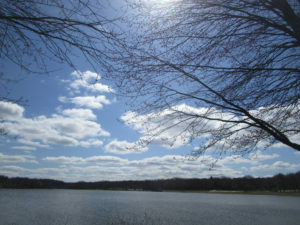 2: “Jamesburg Lake” (properly “Lake Manalapan”) in Thompson Park on the Jamesburg-Monroe boundary of Middlesex County. WEATHER: The National Weather Service office serving the Jersey Midlands is at https://www.weather.gov/phi/. 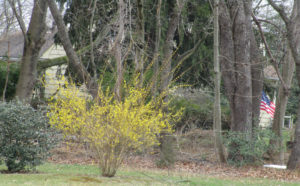 Forsythia blooming in a front yard of a house in East Windsor, Mercer County. April 9 to 15, Monday to Sunday, Mercer County: The annual Princeton Environmental Film Festival, website https://www.princetonlibrary.org/peff/. April 11, Wednesday, 9 a.m. to 3:30 p.m., Somerset County, Hillsborough: The 10th Annual New Jersey Invasive Species Strike Team Conference, Duke Farms, Route 206. More information is available from the Friends of Hopewell Valley Open Space, email info@fohvos.org. April 14, Saturday, 9:30 a.m. signup, 10 a.m. to 1 p.m., Middlesex County, East Brunswick: The 15th Annual Farrington Lake Cleanup, Bicentennial Park, Riva Avenue and Hardenburg Lane. 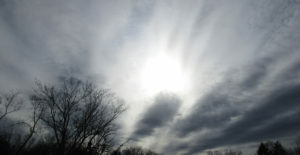 (Rain date, April 15, Sunday, 1 to 4 p.m.). More information is available from Michael Shakarjian at telephone 732-828-3275, Alan Godber at 732-846-4476, website http://www.lbwp.org, or email contact@lbwp.org. April 21, Saturday, 11 a.m. to 2 p.m., Burlington County, Southampton: The Pinelands Preservation Alliance’s 13th Annual Native Plant Sale, Alliance headquarters, 17 Pemberton Road (Route 616). More information is available from the alliance, telephone 609-859-8860 or website http://www.pinelandsalliance.org. April 28, Saturday, 10 a.m. to 4 p.m., Middlesex County, New Brunswick: Rutgers University Ag Field Day, Cook Campus, Route 1 and Ryders Lane. More information is available at website http://agfieldday.rutgers.edu. April 28 and 29, Saturday and Sunday, Hunterdon County, Lambertville: Shad Fest event of environmentalism, entertainment, food, crafts. More information is available at http://www.shadfest.com. 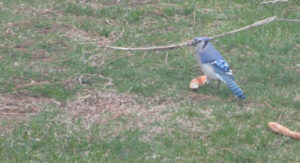 Now, this is a Jersey blue jay, a blue jay, “Cyanocitta cristata,” that eats pizza. In my backyard in Monroe, Middlesex County. Joe Sapia, 61, is a lifelong resident of Monroe — in South Middlesex County, where his maternal family settled more than 100 years ago. He is a Pine Barrens naturalist and an organic gardener of vegetables and fruit, along with zinnias and roses. He loves the Delaware River north of Trenton and Piedmont, too. He draws inspiration on the Pine Barrens around Helmetta from his mother, Sophie Onda Sapia, who lived her whole life in these Pines, and his Polish-immigrant grandmother, Annie Poznanski Onda. He gardens the same backyard plot as did his Grandma Annie and Italian-American father, Joe Sr. Both are inspirations for his food gardening. Ma inspires his rose gardening. Joe is a semi-retired print journalist of almost 40 years. His work also is at @JosephSapia on Twitter.com, along with The Jersey Midlands page on Facebook.com on the Jersey Midlands page.